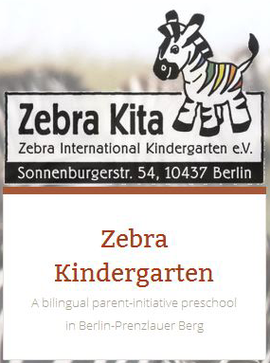 Zebra Kita is a small, parent-run German-English kita in Prenzlauer Berg, Berlin. We’re a friendly bunch of bilingual parents and kids, but first things first: Please do not call the kita. The teachers cannot give any information about the kita or how to apply. We also ask you not to visit unannounced as that disturbs the smooth running of the kita. Now that we’ve got that out of the way, please peruse our website to learn more about the kita and find out how to apply for your child to get a spot in our kindergarten. New to Germany? Maybe you wonder: What’s a kita? Interested in joining our bilingual Kita community? Come along and meet some parents and teachers, have a tour, and find out more about the Elterninitiative concept. Please let us know if you would like to come, so that we can plan accordingly. We look forward to meeting you! BTW: The background photo of the zebras is by Filip Lachowski, used under the Creative Commons license. (c) 2017 Zebra International Kindergarten e.V.